The object of Blackjack Surrender is for the total of your cards to be closer to 21 than the dealer�s cards, without exceeding 21. In Blackjack Surrender, aces count as either 1 or 11, face cards as 10, and number cards as their face value. If you receive an ace and a ten-value card as your first two cards, you have Blackjack and win one and a half times your bet (if you bet was �10, you receive �25). If the total value of your cards is closer to 21 than the dealer�s, you win as much as you had wagered (if your bet was �10, you receive �20). If the total of your cards is more than 21, you �bust� and lose your bet. If you and the dealer have the same card total (17 and up) neither of you win and your bet is returned to you in a �push�. Blackjack beats a score of 21. The dealer will check for Blackjack if his up card is an ace or a ten valued card. Player can Surrender on the first two cards, after dealer checks for Blackjack. If you surrender, you lose half your bet and the game round is over. SPLIT - If your first two cards have the same point value, you may split them into two separate hands by placing a second bet equal to the original bet. You then proceed to draw cards. You may draw as many cards as you like on each split hand, but if you split two aces, you receive only one additional card for each ace. If you receive an ace and a ten-value card in a split hand, it is counted as 21 and not Blackjack. DOUBLE - After you are dealt two cards, and think that another card will allow you to beat the dealer�s hand, you can increase your bet by an amount up to your original bet or �double� your bet. Your wager is doubled, and you are allowed to receive one more card. 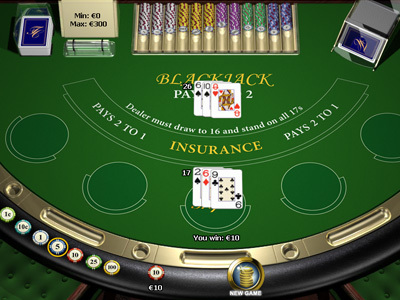 INSURANCE - Insurance is considered to be a game of its own within Blackjack Pro. If the dealer has as Ace as his up card, you�ll be given a chance to buy insurance. When you buy insurance, you�re betting that the dealer has a blackjack. It allows you to try and protect yourself when you think that the dealer may have Blackjack. When buying insurance, you place half of your initial bet by pressing the Insurance button. If the dealer does have Blackjack, you are paid 2 to 1 on your insurance bet. If the dealer doesn�t have Blackjack, you lose your insurance bet. 7 CARD CHARLIE - It is theoretically possible for the player to draw 7 cards without going bust. In this case the player�s hand automatically wins, except when the dealer has Blackjack.